Everybody knows that these days you really shouldn’t publish a music magazine. The internet is awash with album reviews and algorithmic recommendations, not to mention the actual music itself, all offered either for free or a low monthly subscription. But a small band of publishers still work in print, because they think that real, physical magazines provide a fantastic way for communicating the love and fascination they feel for an artist, a scene or a piece of music. Hanna Hanra is editor of The Beat, the free magazine that has been distributed in shops, bars and restaurants since 2010. Renowned for its beautiful photographic covers and in-depth artist interviews, it’s one of the few free magazines I always make a point of picking up. Paul Bradshaw is editor of Straight No Chaser, the legendary music magazine that launched in 1988, closed in 2007, and relaunched again last year with issue 98. I’m really looking forward to hearing him speak about the changes he has seen over the years and his experiences of coming back after 20 years away. 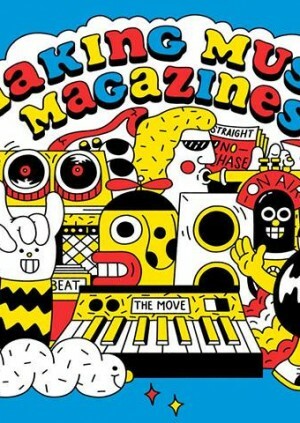 Tom Armstrong is editor of The Move, the magazine that grew out of London’s underground music scene. We delivered it to Stack subscribers in September 2017 and we love its obvious passion for the artists and scenes featured on its pages. Woody Cecilia is editor and creative director of @cool brother, the music magazine that pushes creative collaboration to the fore. With bands taking pictures, illustrators stepping forward as models and artists pictured at home, it’s freewheeling and free to pick up. We’ll be covering creative questions like how to produce beautiful covers and how to tell a story that goes beyond PR-approved niceties. And we’ll also get into the nuts and bolts of running a magazine, including the challenge of making money, and how that continues to change. Talks will begin at 7pm with plenty of time to ask questions and grab a drink with the speakers at the end - see you there!